Canned soup can’t come anywhere near this recipe. With all of the wind and colder weather we’ve had in Scottsdale, I’ve been craving soup and healthy comfort food. This recipe does take some time, but it’s definitely worth it. Enjoy! Remove the chicken from its packaging, drain off any liquid, and pat dry with paper towels. Leave the skin on the chicken, but trim away any large pieces of fat from around the neck or cavity of the chicken. 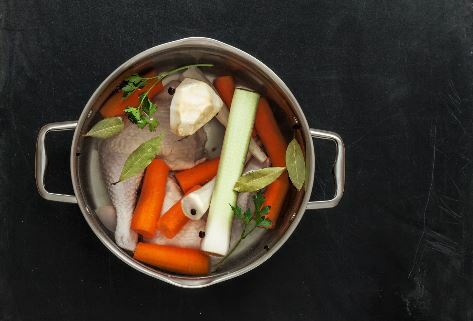 Place the whole chicken in a soup pot. Add enough water to cover by about an inch of the chicken. Bring to a boil, then reduce to a simmer. Keep your eye on the pot as it comes to a boil, and then reduce the heat to low and partially cover the pot as soon as the water is boiling. For the first half hour or so, you’ll see foam and scum collecting on the surface of the liquid. As it clumps together, skim it off with a spoon and discard. Keep the pot partially covered and at a low simmer. You should see slow but steady bubbles and wisps of steam coming from the pot (although don’t reduce the temperature so low that the water falls below 165°F or else the chicken won’t cook through). Add more water as needed to keep the chicken covered, or if it floats, to allow it to bob in the liquid. Simmer for at least 1 or up to 3 hours. The chicken is ready as soon as the meat registers 165°F and easily falls off the bone, after about 1 1/2 hours, but you can continue simmering for up to 3 hours for richer flavor. While the chicken is simmering, peel the carrots and remove the skins from the onions. Chop everything into a few large chunks. Add the vegetables to the soup about one hour before you plan to finish the soup, add all the vegetables, the bay leaf, the parsley stems, and any optional extras to the pot. When done cooking, transfer the cooked chicken and vegetables to a cutting board: Use tongs to pull the chicken and the vegetables out of the liquid and transfer to a cutting board. Strain the broth: Pour the cooking liquid first and then the broth through a strainer and into a large mixing bowl. Return the broth to the soup pot and bring to a simmer over medium-low heat. Chop the vegetables into bite-sized pieces. They will be hot, so handle with care. Shred or chop the chicken. When the chicken is cool enough to handle, pull the meat off the chicken bones, discarding the skin and bones. Shred or chop the meat into bite-sized pieces. Discard the bay leaf and parsley stems. Return the chicken and chopped vegetables to the broth, and warm. Give the broth a taste, and then season with a few teaspoons of salt and a few grinds of fresh pepper. Taste again and add more salt or pepper if needed. Ladle the soup into bowls and garnish with fresh parsley. Store leftovers in the fridge for up to 5 days.